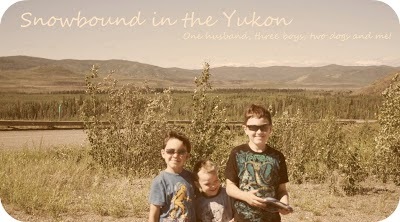 Snowbound in the Yukon: Down time.. Seriously, I'm really dumb to be up right now. SnowBaby went to sleep at 9pm and here it is 11:35 and I'm surfing the net. Seriously I've been sittin' here for over two hours checking out my boards and a favorite blogs and just surfin'. I miss reading about all my online friends. The only thing I didn't do was comment, just used my bloglines and read, and they won't even know i read them because I used bloglines. There were quite a few to read as it turns out. These ladies really are amazing in so many different ways and I do find inspiration from each and everyone of them in some way. I went to the dentist this week. I had a full check up and a cavity filled in. It was a fast, fast trip. Drove to the city on Tuesday, had work done Wednesday morning and after lunch then drove back home. We are leaving on Sunday in the car. I'm getting excited and nervous about the trip, buying a new vehicle and driving home. Shopping and everything that entails, just too much. The boys are almost done being sick. SnowBaby has grown as well, just in a week he's outgrown some outfits and he's awake a lot more and doesn't mind being on the floor for tummy time. It's amazing to see him change so quickly. I really don't have much to write right now, I'm tired and can't think. I'll try to post once more tomorrow before we leave if I have time, if I don't you'll know I was busy. I'm in Whitehorse, we take the plane this afternoon. I hope I'll be able to get on here and say hi. If not I'm gone until next week sometime. I hope everyone stays well. Take care.